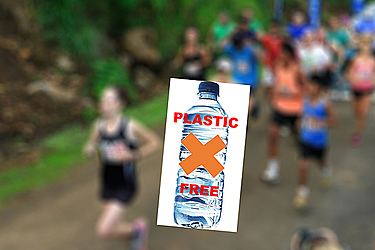 Runners, and walkers, in the ANZ Savai’i Marathon event this weekend on the big island will not be handed their drink during the race in a plastic bottle, instead, ice cold water will be served in paper cups. The move by Samoa Events, organisers of the race, is to eliminate throwaway plastic from its events, starting with the Savai’i Marathon this Saturday. The race runs the full length of the coastline from Saleaula to Salelologa, a total of 42km. Saleaula lava fields is that starting point for the marathon. Pu’apu’a and Fogapoa villages are the starting points for the Half Marathon and 10km race respectively. The ANZ 5KM walk and SSAB 3KM walk have their start at Lalomalava and Saleaula villages. “All these sites are pristine environments in their own right. Keeping them free of throwaway plastic makes sense in every way,” Samoa Events director, Afoa Seti Afoa said. To support athletes on Saturday, there will be ten water stations. Each station will have water coolers with ice cold drinking water and soft food for athletes. “We are going plastic free in most of our events this year. We wanted to kick it off with the ANZ Savaii Marathon to protect the pristine environment of Savaii,” Afoa said. The decision is an environmental friendly choice by Samoa Events – organisers of the second Savaii Marathon and Savaii Games - to do away with throwaway plastic in this event. Samoa Events will hold over 100 event days this year across its many activities of local and international races. In every race athletes and participants need water to survive to the end. The old model of race support saw many bottles of water being supplied and used once before being discarded into rubbish fills. Some no doubt made their way to the sea. At the end of their race, athletes will be served with the best race drink in the world, a cool fresh niu. Savaii will also play host for the first time to all three swims of the Samoa Swim Series later in the year. That event is also plastic free. Afoa said Samoa Events will go plastic free for most of its Events this year. There are two or three events that will be difficult to run with paper cup water support, such as the Warrior Race Half Ironman and Beat the Heat races, also the Ford Tour of Samoa cycle race where athletes are moving at 30-40kms per hour on bikes. Giving out a paper cup drink just will not be possible. Savaii Marathon kicks off the international year for Samoa Events. The next event after that is the Apolima Strait 22.3km swim next week. The last international event is the Sau’ai Savai’i Giants’ triathlon in October.